Goal: This example illustrates how to leverage the Eventing Service to perform a cascade delete operation. When a user is deleted, Couchbase Functions provide a reliable method to delete all the associated documents with the deleted user. 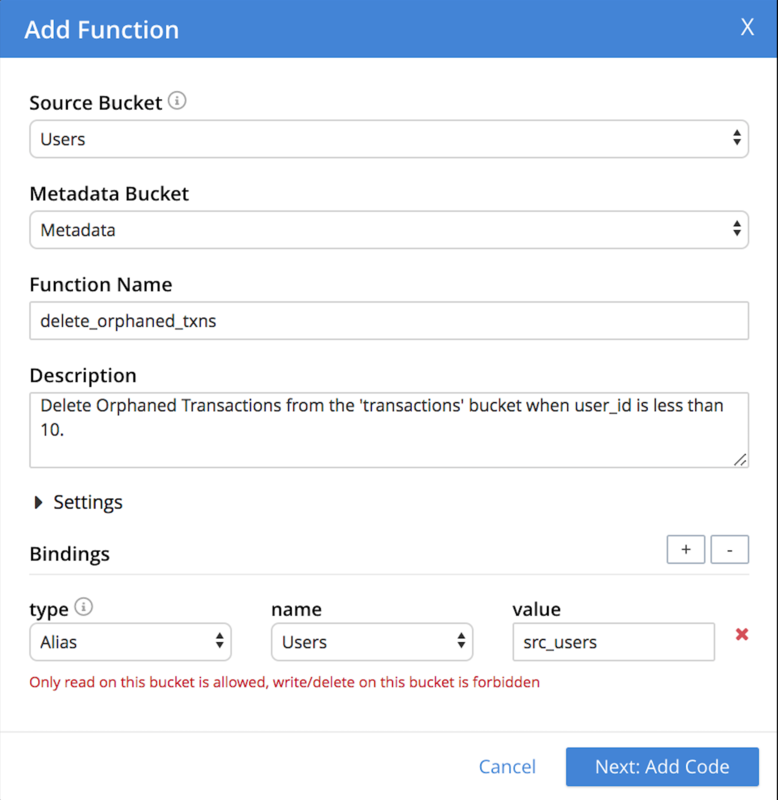 This example requires you to create three buckets: users, metadata and transactions buckets. For steps to create buckets, see Create a Bucket. 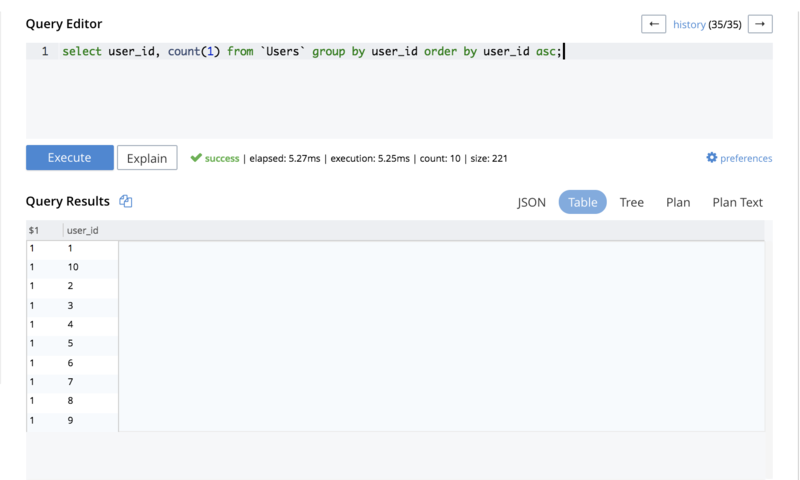 From the Couchbase Web Console > Eventing page, click ADD FUNCTION,to add a new Function. For the Source Bucket drop-down, select the Users that was created for this purpose. For the Metadata Bucket drop-down, select the metadata that was created for this purpose. Enter delete_orphaned_txns as the name of the Function you are creating in the Function*Name* text-box. 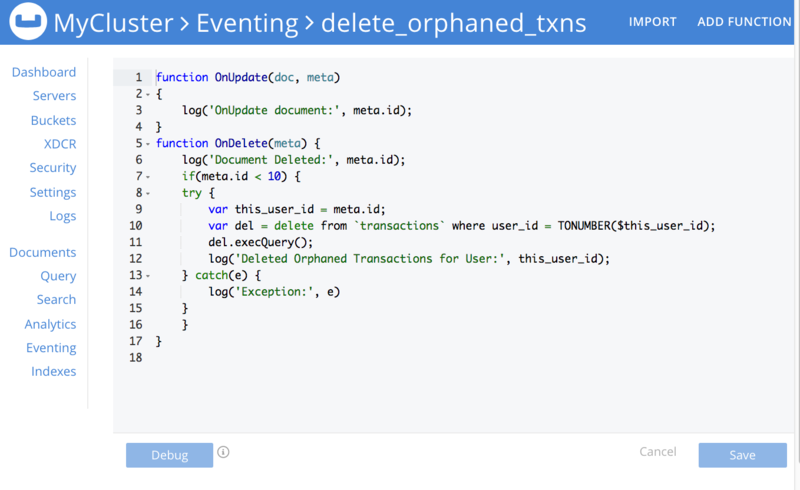 Enter Delete Orphaned Transactions from the `transactions’ bucket when user_id is less than 10 in the Description text-box. For the Bindings option, specify users as the name of the bucket and specify src_user as the associated value. After providing all the required information in the ADD FUNCTION dialog, click Next: Add Code. The delete_orphaned_txns dialog appears. 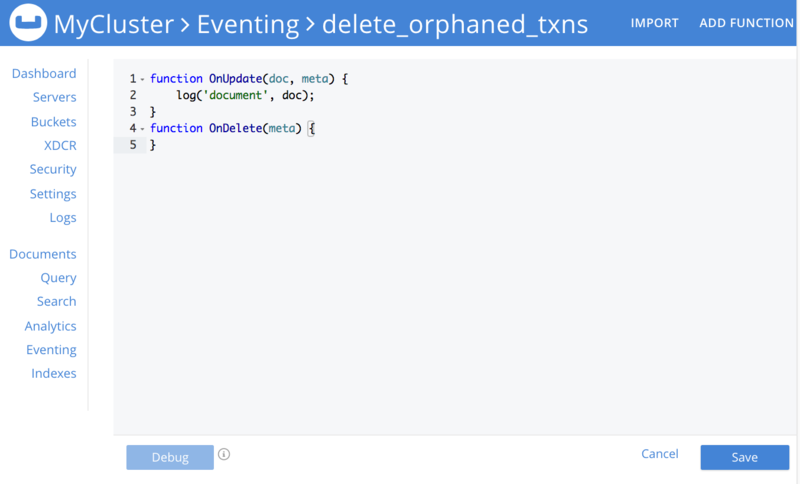 The delete_orphaned_txns dialog initially contains a placeholder code block. You will substitute your actual delete_orphaned_txns code in this block. The OnDelete handler is triggered for user delete transaction. The handler checks if the user_id is less than 10. When this condition is fulfilled, then an N1QL query is triggered to delete all user related information. The handler is then configured to record this delete operation in a Function specific application log file. .
To return to the Eventing screen, click Eventing. The Function delete_orphaned_txns is listed as a defined Function. Currently, it is listed as Undeployed and Paused. 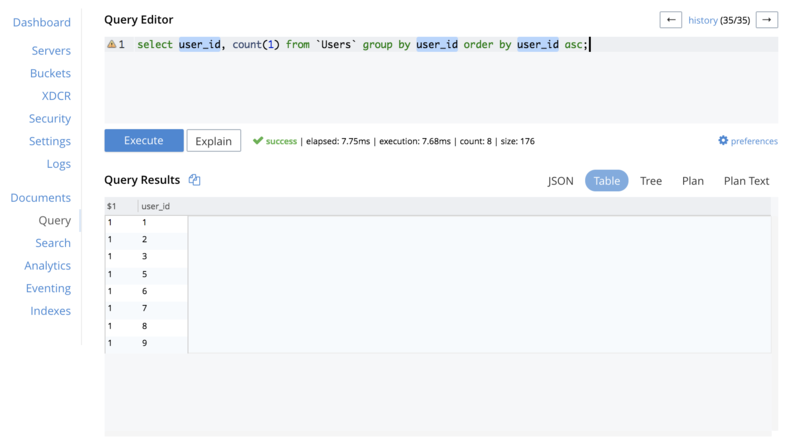 The Query Results display users with user_ids from 1 to 10. Select User4 from the list and click the delete icon. Select User10 from the list and click the delete icon. From the Query Editor, execute an N1QL query to check that all related records for the deleted users are removed from the cluster. In the Query Results pane notice that user_ids, user_id4 and user_id 10 are removed as part of the cascade user delete operation.